With one row of sewing and a button, you can make a hanging kitchen towel. This is one of those projects that is so easy and obvious, but you will use it every day. Hang the hand towel on the handle of your oven so you always have a place to dry your hands. The button makes it less likely for other folks (kids and husbands?) 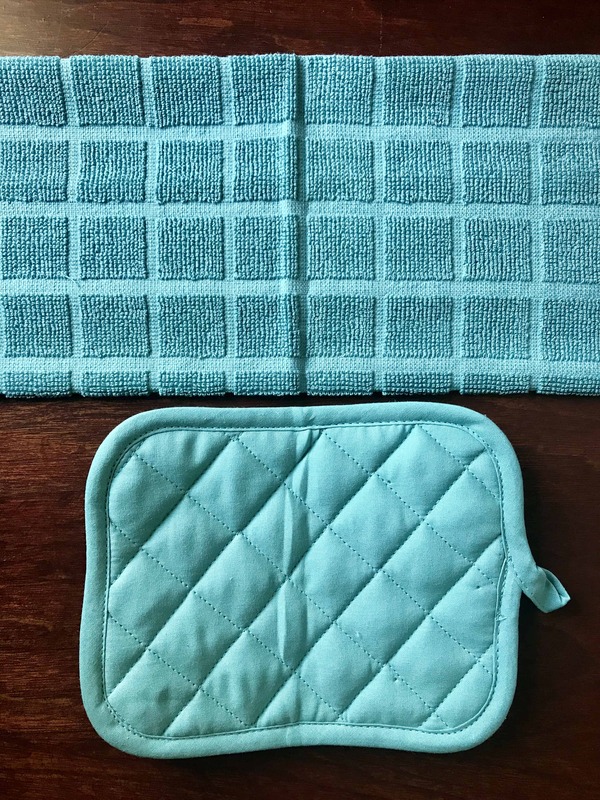 to move the towel, but it is easy enough to remove when you need to use the potholder. 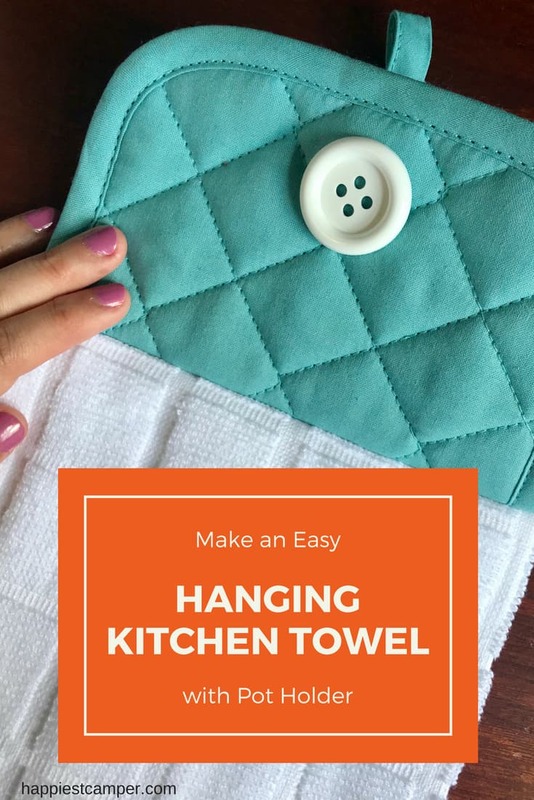 All the supplies to make this hanging kitchen towel are available at the dollar store or your favorite big box retailer making it budget friendly. I can make two for less than $5. Add a set of cooking utensils to make a thoughtful gift too. They are perfect for house-warming, wedding, and moving out/college gifts. If you know the recipient’s colors in their kitchen, it is easy to find towels and pot holders to match. 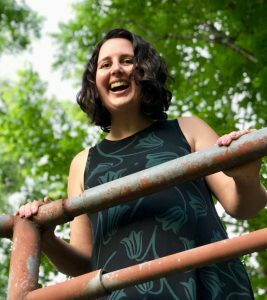 I have given several sets away over the years, and they are always well-received. Let’s get started! A sewing machine makes this project even faster, but it is optional. 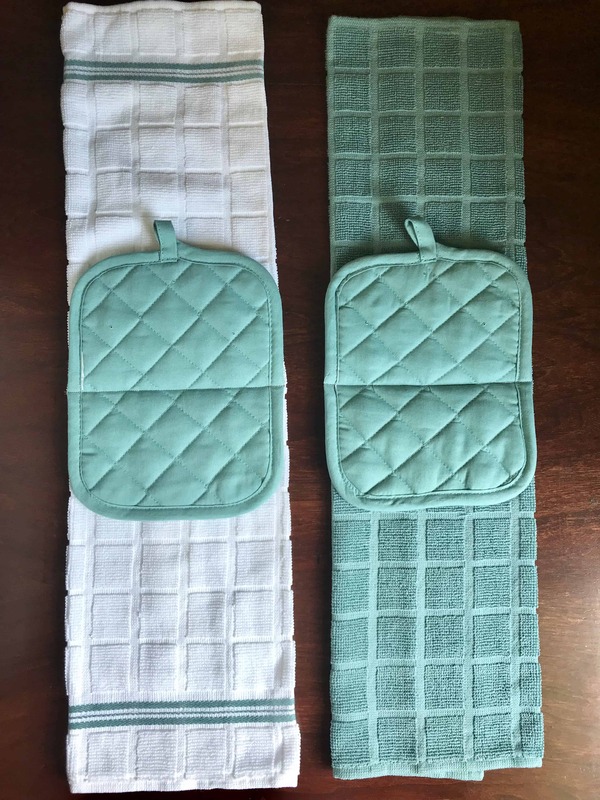 First, fold the towel in thirds lengthwise so that it is roughly the same width as the pot holder. You can measure if you’d like, but I just eyeball it. We’re going for quick and easy on this project! Next fold the towel and the pot holder in half to form a crease down the centers. Place the pot holder on top of the folded towel with right sides together, and line up the seams. Use a couple of clips or pins to hold it in place. Sew along the crease. This can be done by machine or by hand. I had to put the feed dogs down on my machine to get the layers of towel and pot holder under my needle. Then I put the feed dogs back up to sew. Be sure to backstitch at both ends to secure. You’re almost done! I told you this project was quick and easy. Flip the top half of the kitchen towel behind the pot holder and bottom half. Now sew a button to the top center of the pot holder. Choose a button that fit through the loop of the pot holder easily while being large enough to hold it in place. I’m a little embarrassed to admit that I had to run to the dollar store to purchase a sewing kit for this step. If I could do it with my sewing machine, I would! That’s it! Your new hanging kitchen towel is machine washable too. I promise you will use them multiple times a day and want to make more. I would love to make a set with fun designs on them, campers or chickens perhaps. It would be fun to have different sets for the holidays too. 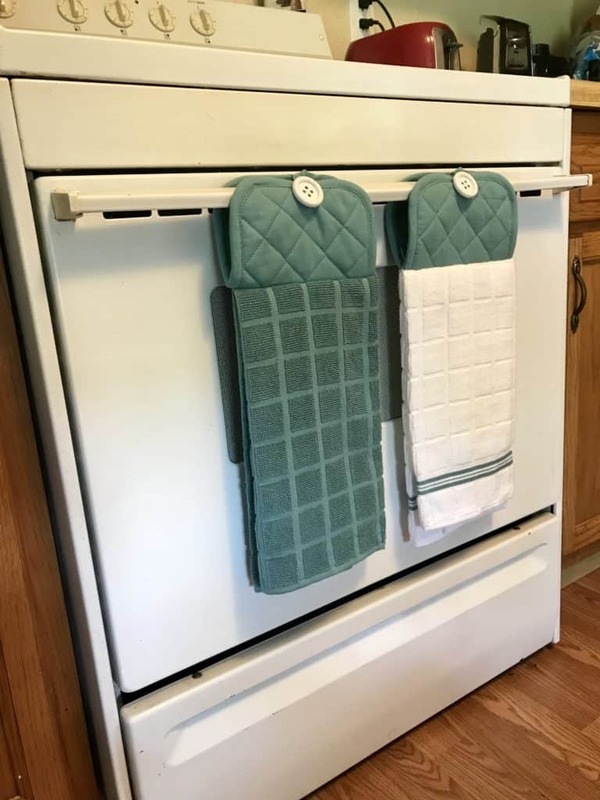 Make a kitchen towel that hangs on your oven door. Fold the towel in thirds lengthwise so that it is roughly the same width as the pot holder. Fold the towel and the pot holder in half to create a crease down the centers. Place the pot holder on top of the towel with right sides together, and line up the seams. Clip or pin in place. Sew along the seam with a sewing machine or by hand. 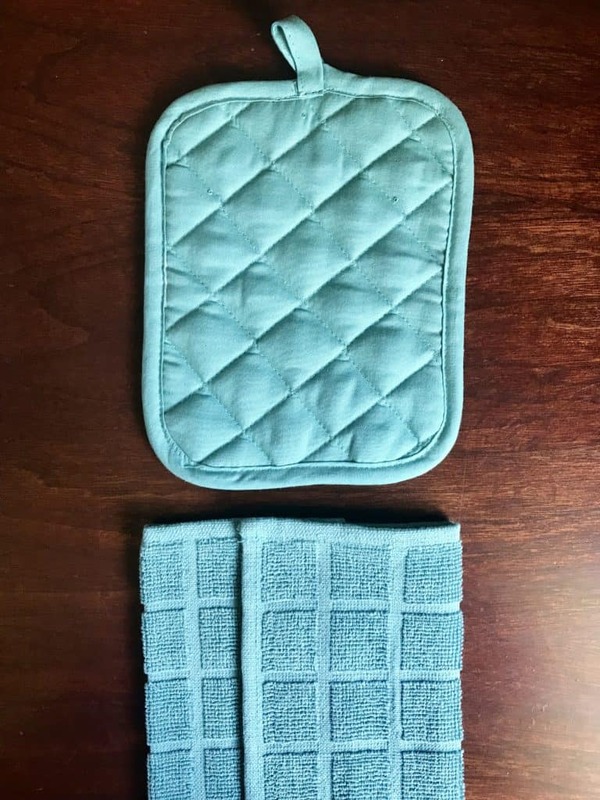 Flip the top half of the towel behind the pot holder and bottom half. Sew a button in the top center of the pot holder. 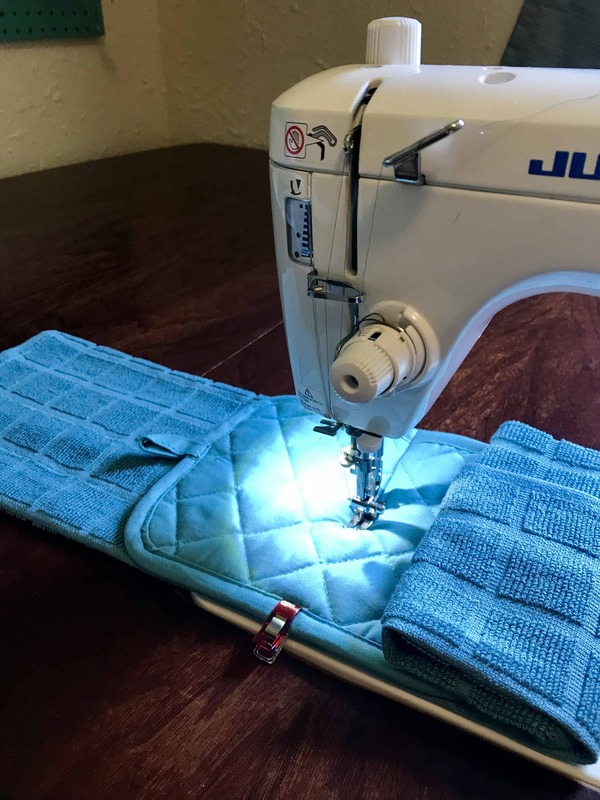 Put the feed dogs down on your sewing machine to fit the towel under the needle. Then raise them before sewing. If you like this easy sewing project, be sure to check out my 5-Minute Wash Cloth Soap Holder too. You CAN sew the button on by machine, as long as your machine does a zig-zag and you can drop the feed dog. I’m sure you can find a YouTube video tutorial. You can use your sewing machine to sew on buttons. Drop the feed dogs, adjust the stitch width (for zigzag stitch) to match the holes on your button, and set the stitch length to 0. Hi Jan. My machine does not have a zigzag option, but I hope your comment is helpful to someone else. Sounds like I need a second machine too! 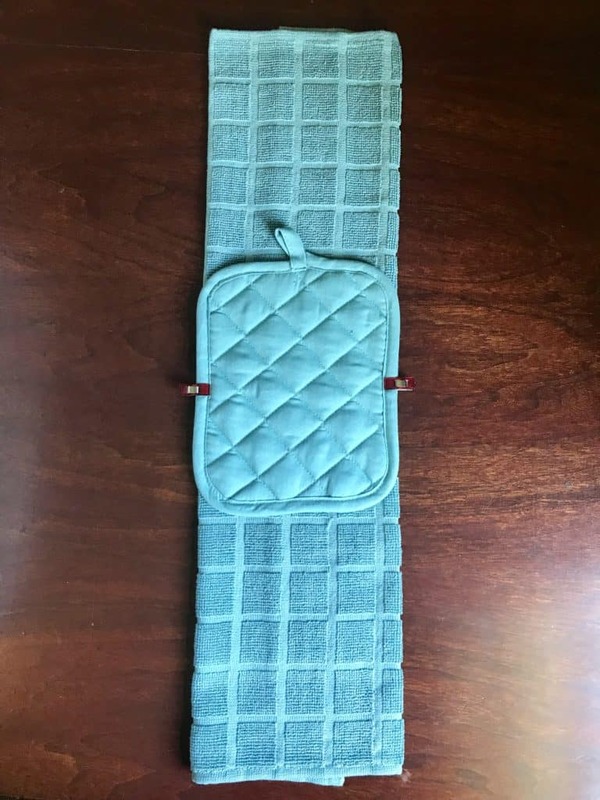 Cool idea, but I sure hope the plastic button doesn’t come into contact with anything hot when you use the hot pad. Excellent point, Dianne. Have to be careful about that. Of course! You’re a smart cookie, Betty T.
Hi Happiestcamper2 , these are great. We have made cuptowels that hang on stove handle w/ crocheted tops and a half pot holder w/ half towel but these are the best. And not cutting makes less sewing and 2 uses. Thanks. No cutting is the best part! Thanks for stopping by! I’ve made a few of these and the hardest part was finding buttons in the right color for my project and that would fit through the loop. I consider myself an seamstress, so I used a seam ripperto “adjust” the. loop and madyit work. These are do handy and inexpensive to make. 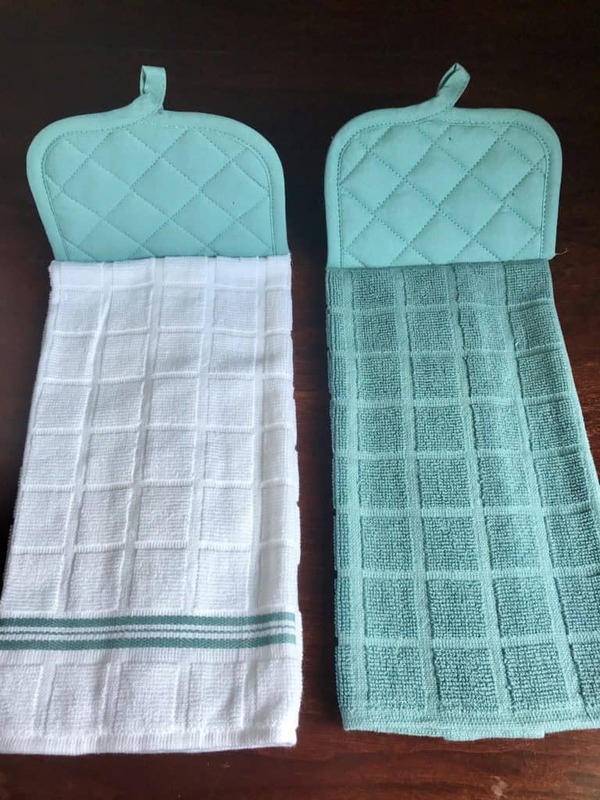 I found sets of 3 towels, 2: rectangle pot holders with matching oven mitt, at Walmart for about$5. My goal is to try to embroidery kitchen designs on some for cute gifts. Adjusting the loop is a great tip! I would love to see how your embroidery turns out. They really are handy! Since you fold it in half anyway, I think a round potholder would also work (and you would get a curved top). I have some cute novelty buttons that would be great for this. A round potholder would be super cute! 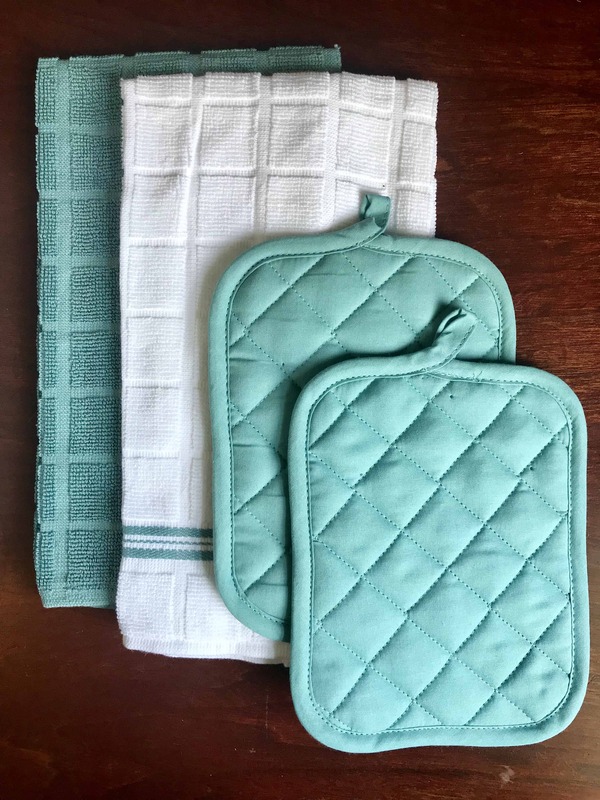 Just found brand new dish towels and matching pot holders at our local Good Will, $1.49 for 2 brand new dish towels and $1.49 for 2 pot holders! I hand sew mostly. Going to make 2 hanging towels for one gift at a family wedding in April 2019. Do you find you needles break readily? Do you use a particular needle? I did not have any trouble with needles breaking. You may need to adjust the tension on your machine. My needles are by Organ Needles Co, but I didn’t buy them for any particular reason. A pack of 500 came with my machine. I’m so glad you like them! I’ve been meaning to make some hanging kitchen towels in pretty colors for Sprig. I bet the dollar stores have some good ones. Such a simple , but great idea. Reminds me of how I added more storage to my travel trailer. Target had these wonderful wooden box with a drawer. Screwed them to the bottom of my hanging cabinets and now have 3 more drawers in my kitchen for less than $20 bucks. Love simple solutions to problems. I’m going to have to go work on my sewing now. Good tip!!! 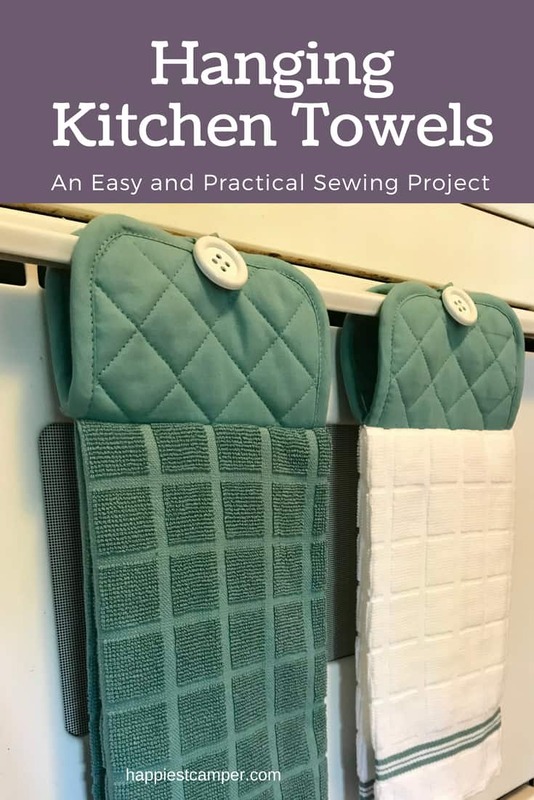 I have made a lot of these but I open the towel and put 1 inch folds across the towels (lengthwise) pin them in place, then place the hot pad across , sew it on. It gives the towel a little different look especially if there is a picture on the towel. Those are great, Diane! The best part of sewing is making things exactly to your liking. How wonderful that you are teaching your granddaughter to sew. Your comment made my day!